Our turtle has a local viewpoint. 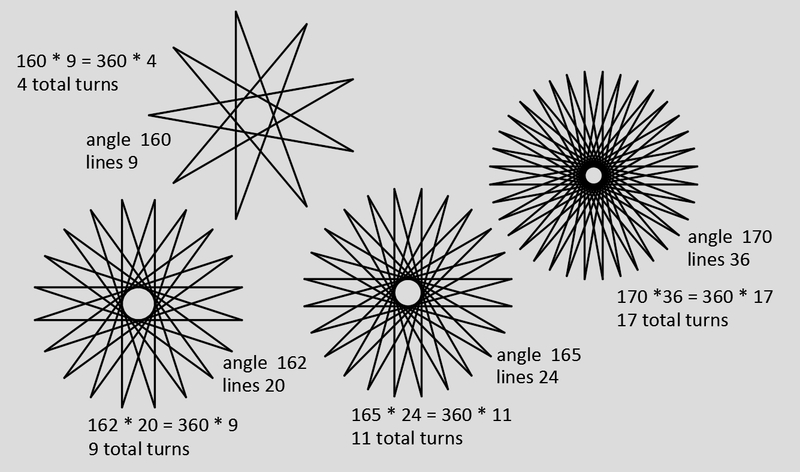 He can draw a line one unit, turn one degree, then repeat that 360 times, coming back around where he started, but at no time is a center or radius known, even though the approximate circle has both. By measuring the drawn approximate circle or by doing a little math the radius can be found. The circumference is total direction traveled. Using the formula Circum = pi*(Dia) and substituting 360 for the Circum the radius is found to be 180 / pi or approx 57.3. If we make the subroutine more general to accept as input the angle turned between each line and the length of the lines, we no longer have a loop of 360 and we need to calculate the number of lines to draw. Longer lines will give larger diameters. Larger angles will give smaller diameters. We can see by experimentation that every ratio of line_length to angle has a definite radius, so lets find that equation. We already needed an equation between num_lines and ang, which was num_lines = 360 / ang. If for instance we turned 120 degrees with each turn, we would only need 3 lines and our approximate circle would be a triangle. If we turn one degree, we need 360 lines. the circumference is num_lines * len_lines. C= (num_lines) * (len_lines) and into that we substitute our calculation num_lines = 360 / ang. and there is our ratio of line length to ang as a direct proportion to R.
Don’t forget, like I did when measuring the radius of a polygon, this radius is calculated by adding the straight line lengths and calculating the radius of a circle of that circumference. If the straight line approximation is crude, the radius will be crude. The more lines used to approximate the circle, the better the radius calculated from them. R and ang can be switched with a little algebra to find ang. 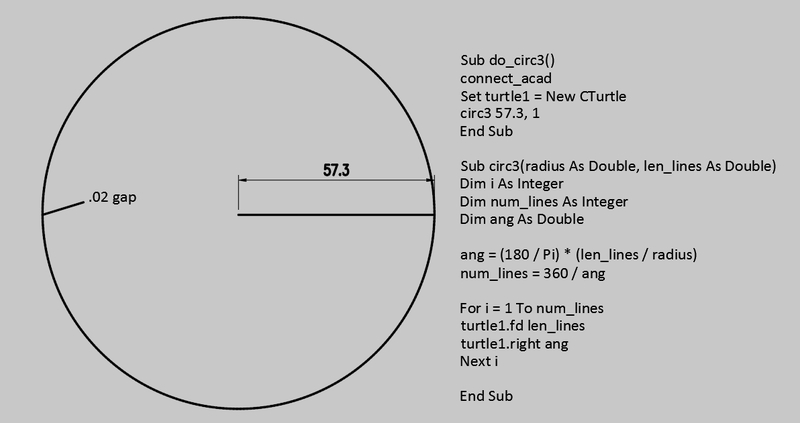 and now we can re-write our sub-routine so it accepts the radius and len_lines as argument and calculates the angle to turn each line and the number of lines to close (or almost close) the circle. Finally having written a general program to draw circles of a given radius using straight lines of a given length, drawing an arc of given degree is just reducing the number of lines drawn by the same ratio as arc degrees to 360. A very useful, advanced, early book is “Turtle Geometry” by Harold Abelson and Andrea diSessa, two MIT scientists, published in 1980. The MIT group had been working 10 years or more at that time with Turtle geometry, Logo and Lisp. The book is written with emphasis on the mathematical ideas, not any specific implementation. The ideas are just as valid now as then. We can use their substantial, challenging concepts and implement them 40 years later. Our examples can go beyond what they show, because our tools are so much better. 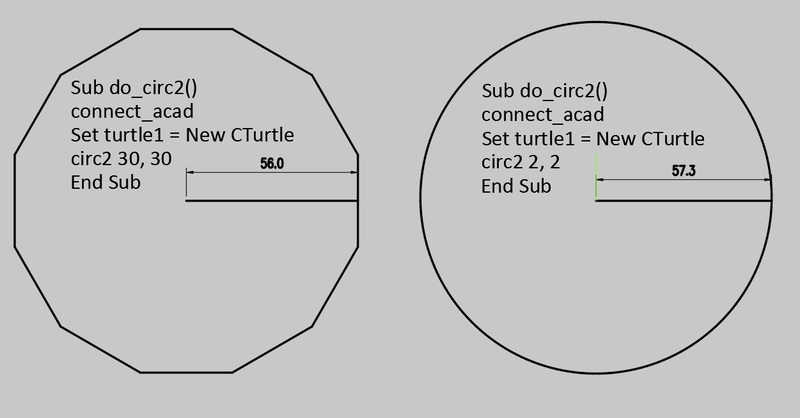 I am doing a turtle graphics implementation using Autocad, creating a turtle class in excel VBA. Excel is simply providing the VBA editor. The principles and code would would work just as well in dot net, and identically in vba native in autocad or bricscad. Position and Heading are the two basic turtle properties. Heading will be in degrees, between 0 and 360, not including 360. VBA and autocad demand radians. Our subs will do the conversion. Position consists of variables X and Y (and Z when the turtle sprouts wings some day). We will use type Double for all. Class variables are either Private or Public. If a variable is Public it can be set directly. That should do for X and Y. If Heading is public, then Turtle.Heading = 361 is possible. We want to convert values to between 0 and 359.99. Get and Let manage Private class variables. These can be named anything you want but they cannot have the same name as the variable they control. Basic turtle commands are FORWARD #, BACK #, RIGHT # and LEFT #. These are methods or procedures that change Position or Heading properties. PENUP and PENDOWN change a boolean PEN variable. Current Position is x1, y1. 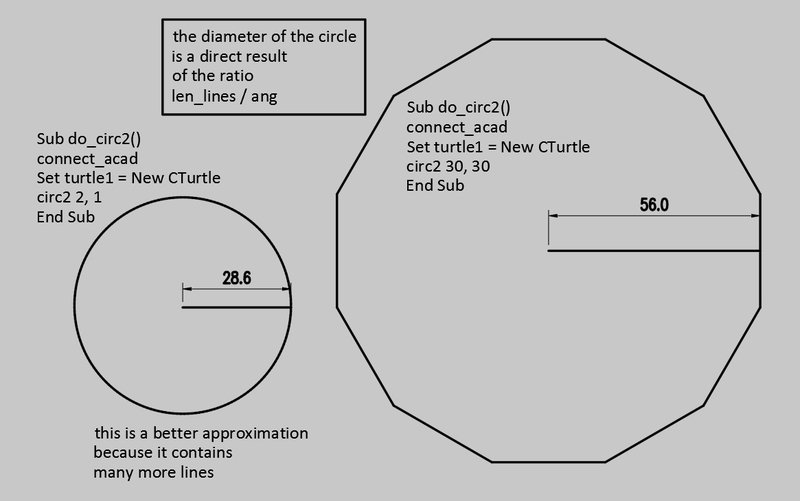 The other endpoint of the line the turtle is going to draw is x2, y2. The heading is private. All others are public. In the class module is the Let, the Get, and the convertang function. The only way to set the Heading is thru Let which converts every angle to a value between 0 and 360, no matter how many consecutive turns or negative values added. The basic line drawing function is FORWARD #. Position and Heading are known. The only value required is distance. The other end of the line, x2, y2, has to be calculated with Cos and Sin, which require radians, not degrees. The value of the Pen boolean is checked to see if the line is to be drawn. The line is drawn with normal autocad vba methods. Finally the endpoint x2,y2 is made the new current position. Since this is autocad, or something very much like it, we could definitely have turtle properties for line width, color and type. But we will save those for later. Back is the same as Forward, except we add 180 to the direction, but we do not change the Heading variable. 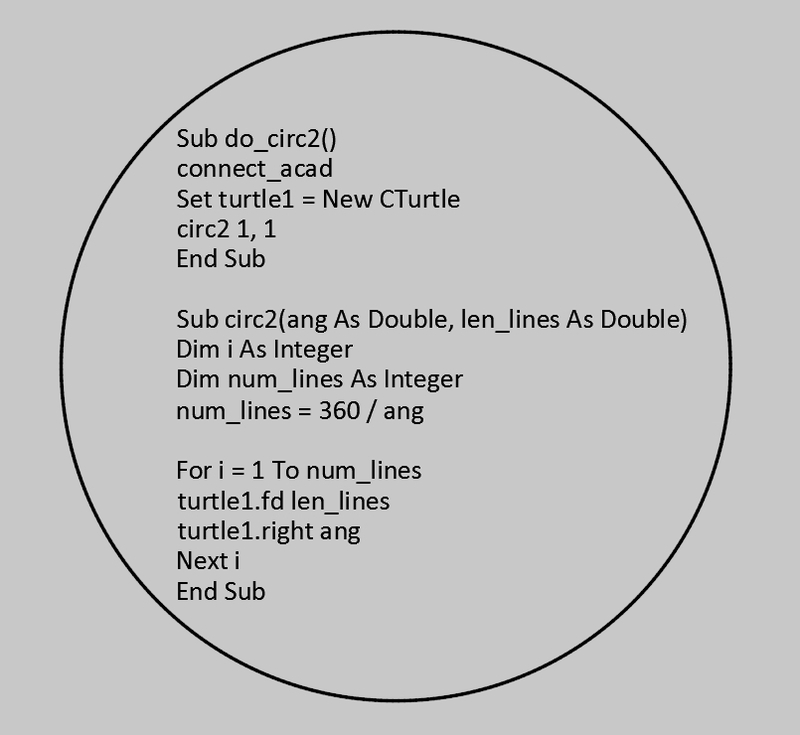 The variables are set with default value zero, so that debug.print turtle1.x1 would print 0. In the class module you can set initial values. To begin drawing, lets start with a basic polygon. An interior angle of an equilateral triangle is 60 degrees. The exterior angle is 120 degrees. The exterior angle is the angle you would turn if you were walking the lines of the triangle. Its the continuation of the line you are on past the vertex onto the next line. 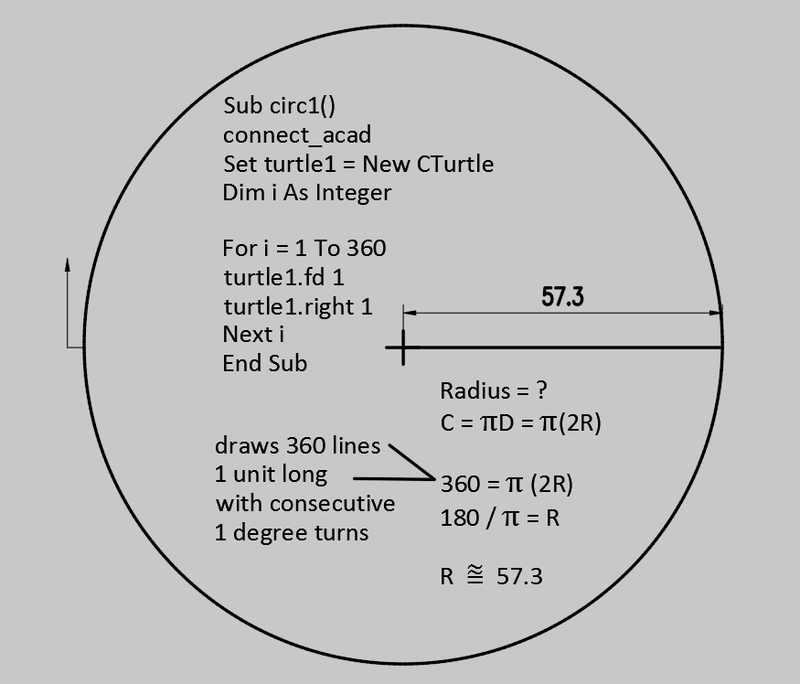 Its “how much the turtle must turn in drawing the vertex” (p.7 – Abelson). In practice to save a little typing, I will do some of the declarations in public and subs. To generalize a polygon, the total exterior angles sum up to 360 – the turtle makes one full turn to come back to its initial heading. 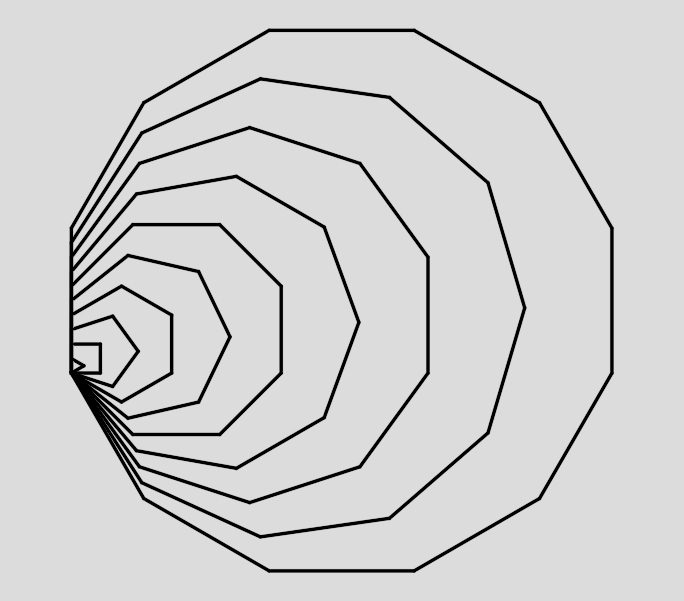 The simplest polygon, or N-gon where N stands for number of sides, would have one degree turns and have 360 sides. This has to be called by something with arguments. You have to know what the arguments are to get good regular polygons. 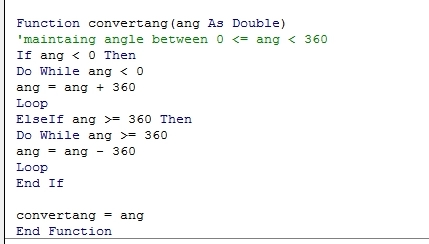 I am sticking with double as type for angle, not integer. Num_sides has to be integer, because a half side is not realistic, and also num_sides is used as a counter in a for loop. A double actually would run there without error, but sooner or later you would miss your expected result by one item due to a rounding error. Here is a demo which makes a variety of polygons. Given the number of sides, and given the fact that the exterior angles always add up to 360, the turn angle is just 360 / num_sides. In the case of 7 and 11 sides, the angle is not an integer. Its a repeating decimal. I let vba calculate the number and feed whatever precision it wants to autocad, and it closes the polygon fine. Since the angle is calculated we could put that into the sub and take it out of the arguments list. We could do it the other way, calculate the number of sides from the angle, but thats trickier because num_sides is an integer and we might not always get an integer from a division. So we can calculate angle, take it out of the argument list, and get exactly the same results. But what about this idea of knowing the angle and not knowing the number of sides? The polygon is done when the turtle turns exactly 360 degrees. If the angle is a double though, some angles are not multiples of 360. If we are not going to control the loop with the number of sides as a counter, we need a way to stop when the turtle returns to its original heading and an emergency stop in case it never does. Using doubles for heading, there is no guarantee it will ever exactly be 360 degrees once it starts, due to double rounding imprecision. Here is a Do Loop where the test is at the end of the loop, so heading starts out zero, or whatever, it adds one increment, then it checks before running the loop again. In addition I have an emergency counter to stay out of an infinite loop. The parameters are length of the side and angle. No opinion expressed about how many sides there will be. In practice it turns out and is logical, if the angle is an integer, the maximum number of sides will be 360. Angle 45 should give us an octagon, and it does, with 8 lines. 90 gives a square, 120 a triangle, 36 gives a 10-gon. What if I try to draw a 7-gon? First lets let VBA do the math. Looks like it works fine, but when I list all the lines, I get 201 (or whatever my max counter is). They are on top of one another, I dont see any separation, I dont see any difference in the listing, 8 decimal places, but there is a difference out there somewhere. It looks like a septagon. It appeared to work before because we were controlling the number of sides, and here we are not. We knew there would be non-closing figures. Any angle, integer or not, that is not a multiple of 360 is not going to give a closed polygon. For any angle that is a multiple of 360 we get a simple convex polygon. 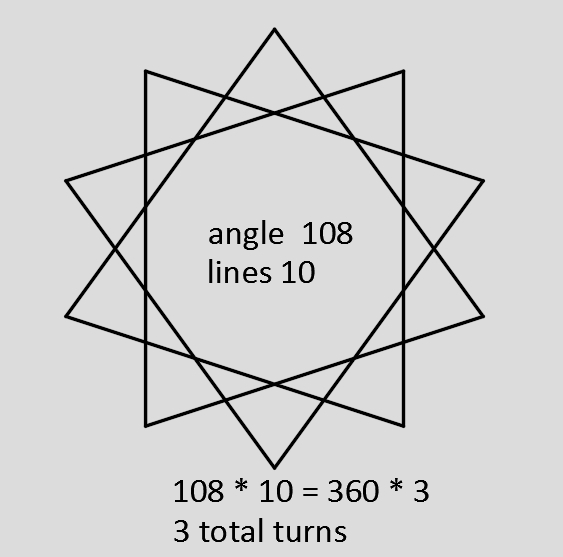 Some angles are not multiple of 360 but a multiple of 360 times an integer. For instance, 108 * 10 = 360 * 3. If we input 108 the figure goes all the way around 3 times before the heading is exactly zero again, and it draws a total of 10 lines. The basic idea of turtle graphics is that the pen has a location and a direction. The instruction to draw a line only needs distance. The ending point is the new current location. 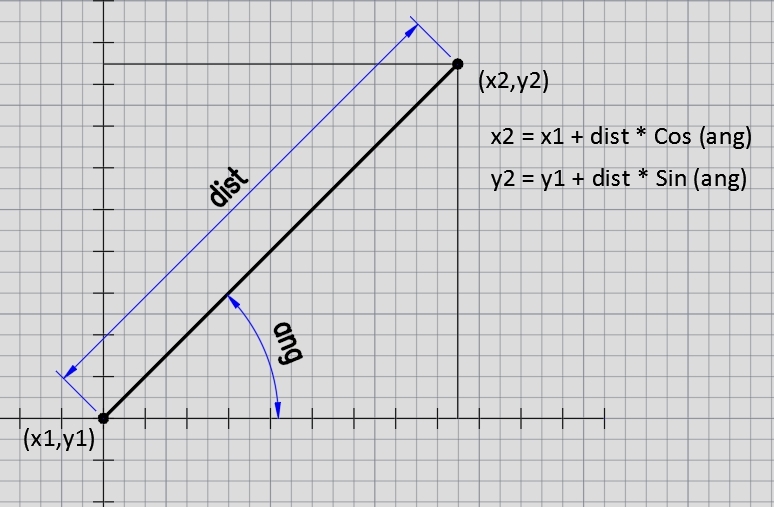 To translate distance at angle from a given point to coordinates the Sin and Cosine are used. The public class variables are x1, y1 – the current location, the beginning of the line to be drawn, and x2, y2, the calculated end points. Heading is a private double. It is private so that the class can always keep the angle heading between 0 <= heading < 360 no matter how many cumulative turns. A boolean PEN variable allows a PENUP or PENDOWN state. Turtle1.FD 6 draws a line 6 units (assuming PEN is DOWN). Turtle.Left 45 and Turtle.Right 45 turn heading to the left or right 45 degrees or any number. Input to the user is in degrees. The class module converts to radians in private. 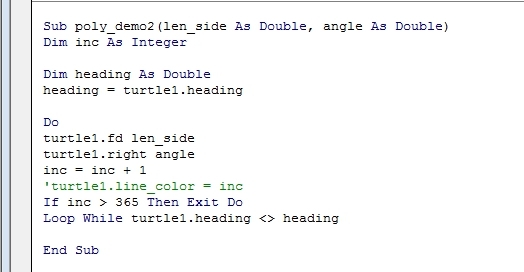 The Class Module code for the turtle to draw a line contains the trigonometry to calculate the point at dist and angle. It draws the line using the familiar AddLine method with EndPoints as an array of 3 doubles, xyz. This is a 2D implementation, Z is always zero for now but does not have to be. Instead of doing the calculations, Autocad provides the Utility PolarPoint to do the trig. Polarpoint returns an array. Autodesk help uses a Variant to capture it, but a dynamic array works fine (see pt2). We can further simplify this process with a function to populate point arrays. Every Point can be declared as a dynamic array. we can streamline a little bit more with a dedicated Line sub-routine. now lets compare the turtle and more conventional autocad methods. Each will draw a line and turn before drawing the next. Using dynamic arrays, what was pt2 can become pt1 with a simple assignment. That is not possible with the conventional static array where points are declared as – Dim PT1 (0 to 2) as Double. Turtle graphics has geometry implications, start here, go forward, turn and repeat. Turtle graphics is local with a simple interface and limited command set. Coordinate graphics is a global grid, but its interface can also be simplified. The two approaches might be able to work together. any comment in the code causes wordpress to substitute the html equivalent, even the code tag vb with quotations gets corrupted. use wordpress code tag and it moves by itself above an empty line. I really struggle sometimes with wordpress and its code behavior. The only way i even get it to work is to load the old editor. There is an easier way to edit posts, they helpfully remind me. I tried that a few times.